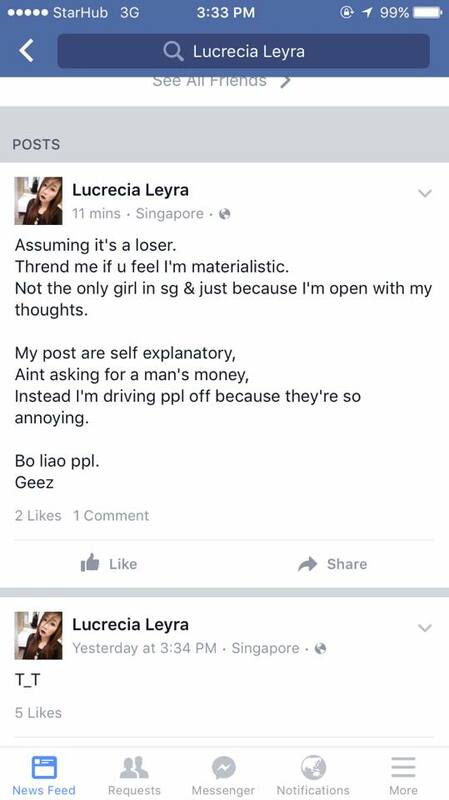 SINGAPORE – A young local female, with the name of Lucrecia, made a public post telling the public not to waste her time if you are not rich enough to buy her a LV Bag (branded bag). Stop asking me what I want for a present. Unless you’re rich enough to buy me that YSL or LV Bag. Don’t bother asking me out on Valentine’s day either. I’m not that average cute girl that u can handle. Don’t come near me because of my looks, Ill scare u off with my attitude. Time to get back on track & wake up from a dream. I’ve gotten too spoilt. Branded bags, cosmetics, diamonds, hotbod, looks & career. A public commented that he saw the a post from Facebook that this young female who thinks she’s made of gold, as her looks are normal at best but yet so arrogant. 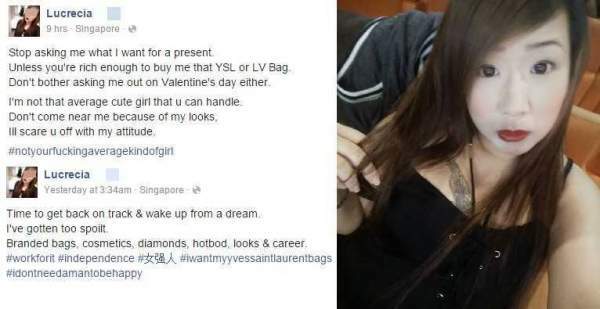 She demand guys to be rich enough to buy her branded bags, else can forget about asking her out for valentines day. Such attitude makes him sick in the stomach. He also continue that he hope she is the minority in Singapore if not we are doomed. UPDATED @ 2/2/2016 8.51AM: The teen made a new public statement online. Share with us what do you think of her below!